Blog | Bartok design Co. Blog – Page 29 – Bartok design Co.
A client reported a (superficial) crack to an asnaro tub we shipped earlier this year. The ofuro was made with well dried ao-hiba and something like this does not happen unless the wood is really very dehydrated. Before thinking of a way to repair the crack, we should quickly isolate and eliminate the problem otherwise the tub may suffer more damage. Is there a heater or radiant floor in the bathroom? If yes, it should be kept off while the tub is empty. Is there central air conditioning? Often these systems have dehumidifiers in line. Again, the AC should not be used in the bath area while the tub is empty. Keeping some water inside may preserve the tub for periods when it is not used. Anyway, it is important to either fill the tub to the top, or keep few inches of water and a cover on the tub so that the humidity can reach also the area close to the edge. If the tub is left unused for extended periods and the AC/heating is very powerful, the option of keeping some water inside and a cover on top may not be sufficient as the dry environment would attack the outside of the tub. In this case I recommend to wrap the tub also on the outside (as much as possible) in a similarly to the way it was delivered. Wishing that this would never happen again, from now on, we will include with our bathtubs a complimentary hygrometer. 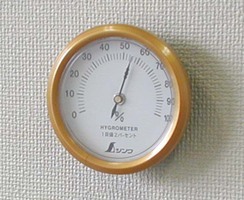 We recommend to keep it in the bathroom and be sure that the humidity is above 55-60%. 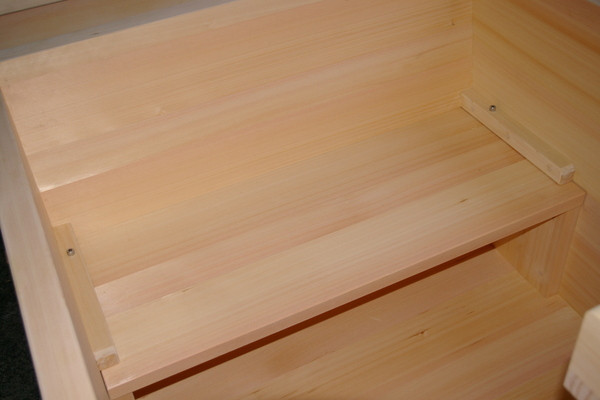 If the environment is very dry, and the tub is seldom used there is the chance that the wood may crack. 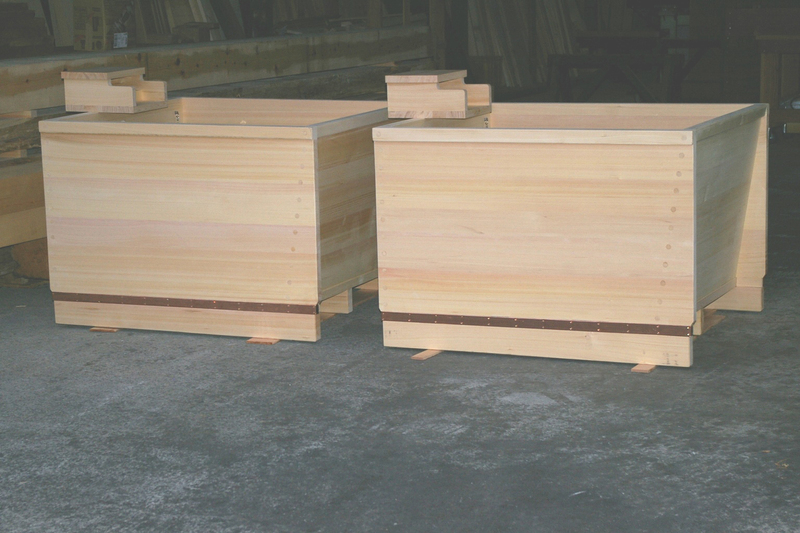 Here are two squarish hinoki bathtubs ordered thru an architecture office in Malaysia. They will be installed is similar condo units, behind a large glass partition separating the toilet/lavatory area from the large shower/bath area. The side behind the bench is slightly slanted. to the left: the back of the tub with western type overflow socket. The english term “laminated wood” includes rotary cut veneer lamination (plywood) and square rods finger joined (glulam). We have the image of the laminated wood as an engineered material, sturdy but unequivocally man-made and thus not natural. 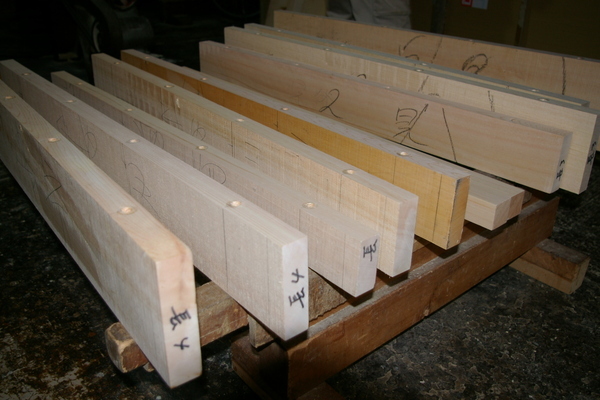 Here is the solid lumber with thru holes ready for joining. Here is the finished “hagi-zai”. 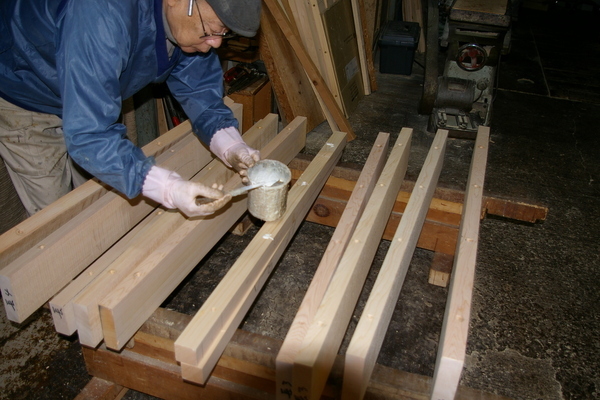 At this point it is straightened and prepared for the “shiguchi” = wood joints. 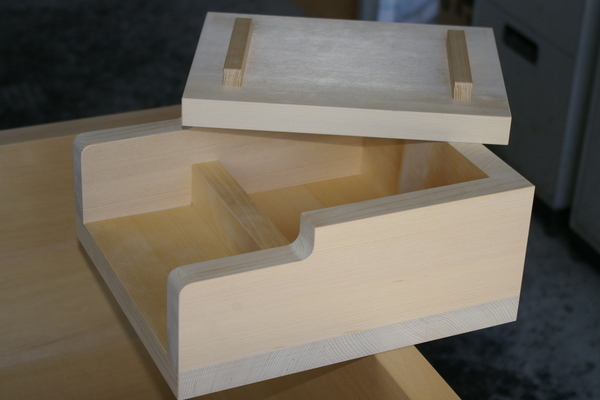 (To create a box we use mostly dove tail joints.) 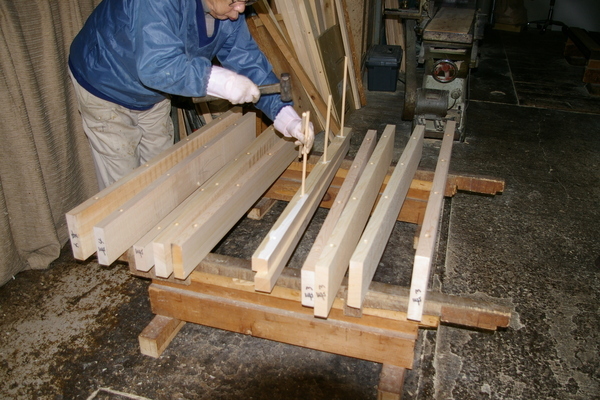 Finally the panel are assembled to create the tub and hand planed. The client is renovating a two-story terrace house in Singapore and choose a japanese wooden bathtub for himself and his family. We hope they can enjoy it everyday! details: copper apron, copper plate joints. Iron brand at front top-right. The drain fitting is not installed and we supplied it separately. The spout can be opened easily for maintenance and cleaning. The autumn brought a weak yen both against the dollar and the euro. This means it is a good timing to purchase japanese goods, especially when they are priced in yen. This post is not to push the back of our readers and convince them to buy an ofuro. In particular now, it is a very busy period and we have a 45-60 days lead time for the production. 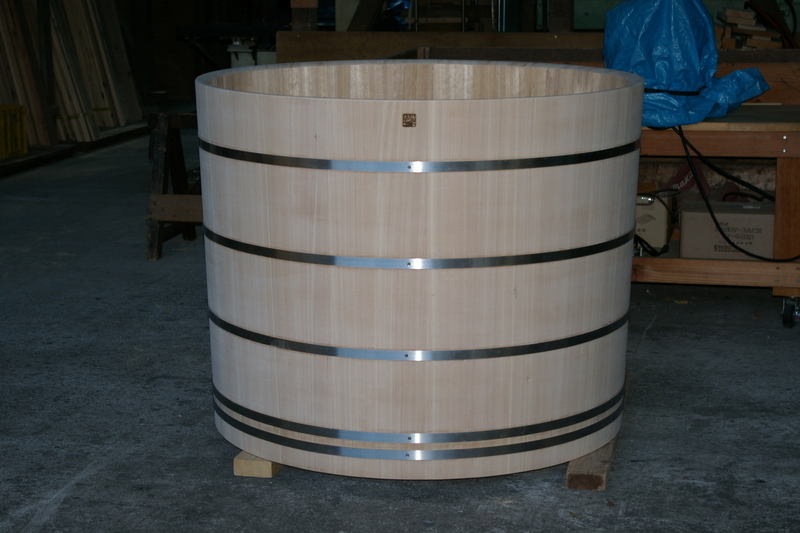 The reason for this post is that I know that japanese hinoki tubs are expensive, and remain a dream for many. Well, this may be an opportunity to bring home a japanese product with 15% discount compared to 2 months ago: so if you are considering buying and ofuro, I friendly recommend you to do it now. I welcome all your questions and comments. 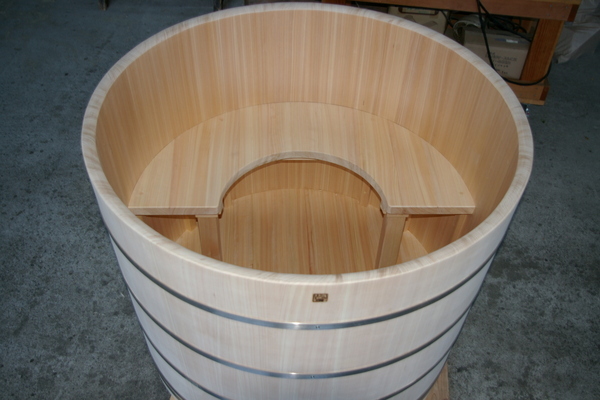 We made this beautiful hinoki tub for a famous fashion designer. The shape is very minimal, with L shaped corners. The wood is natural look knotty hinoki. 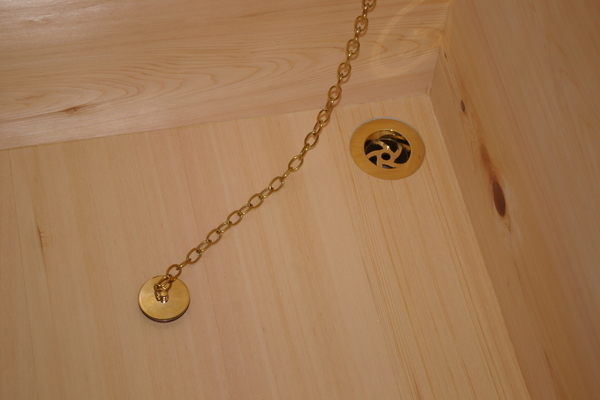 And here comes the stroke of genius of the architect: they supplied a polished brass drain plug. As you can see, the result is refined and bold, transgressive and classical at the same time. For an easier installation, we recessed the socket nut on the back of the tub to leave the threaded section as long as possible. We also supplied a coupling ring to connect it to the drain pipe on site. details: 42mm thick boards, wooden dowels, apron w/ natural oil finish. The architect also asked us to apply the iron brand on the bottom. He wanted to keep the look as minimal as possible, but the brand is important, even if it is not visible. We also supplied a custom stool, with a cut on top for an easier grab and to drain the left over water. 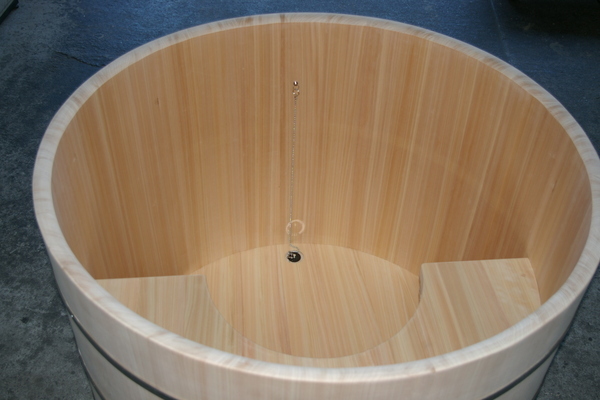 This barrel type bathtub is so bold and well proportioned.I am dying to see the pictures of the actual installation! The ordering process was very smooth. We sent some wood samples for approval and the architect was happy with the “sawara cypress” refined tanned look. 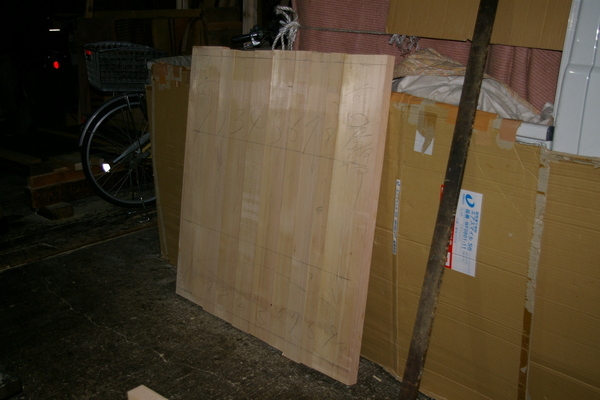 Anyway this wood is not suitable to build a duckboard, so the local carpenter will provide for it. This tub is deeper than normal as the client is very tall. 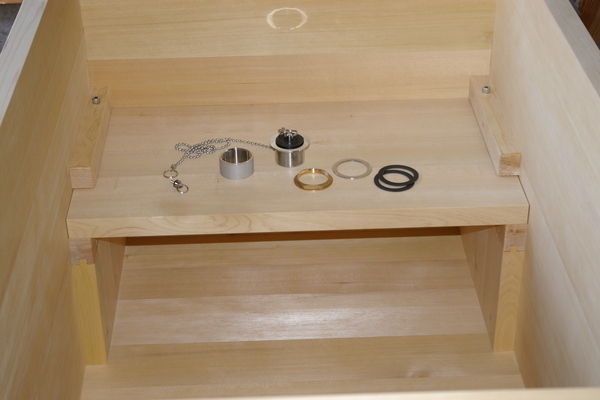 details: barrel construction, stainless steel bands. 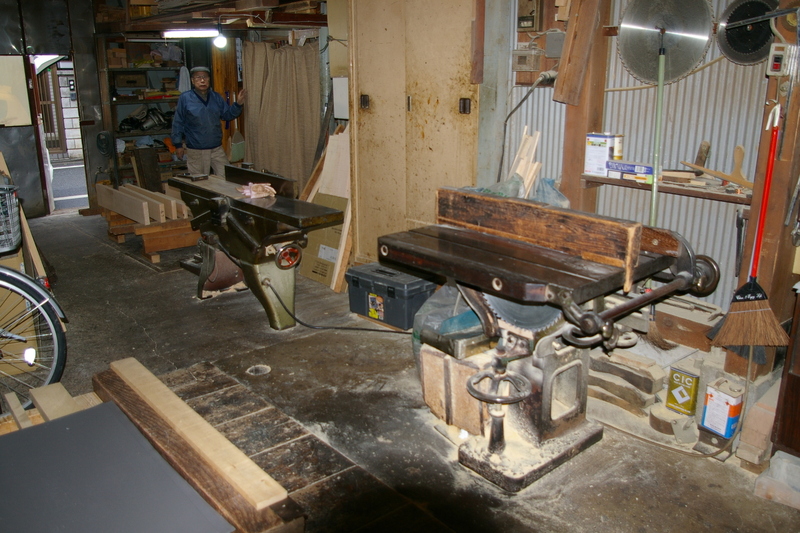 The ofuro is equipped with an internal bench around half of the perimeter. The bench is also useful an aid to step inside. Our indiegogo campaign just ended. Thanks your help and efforts, the pocket-onsen was shared on facebook 419 times and retweeted 44 times. It was featured on the Gadget flow, Rocketnews and several local newspapers. Anyway, I am developing the product and will deliver the kits around dec. 15. What has been really amazing about this campaign is the amount of insight, passionate advice that you gave me. Starting with the naming, the content of the kit, the graphics, the packaging! The pocket-onsen was really “crowd nurtured” and this has been a mind sizzling experience. I am really grateful for it. I am now in contact with some hotels and hotel chains who are interested in selling it in the spa gift shop or offering it as a novelty in their higher rank rooms. There are several ryokan style hotels and japanese themed hot springs around the world and if you have some connection I would appreciate if you can spread the word about the pocket-onsen. I am looking forward to the developments of the relation we are building together. 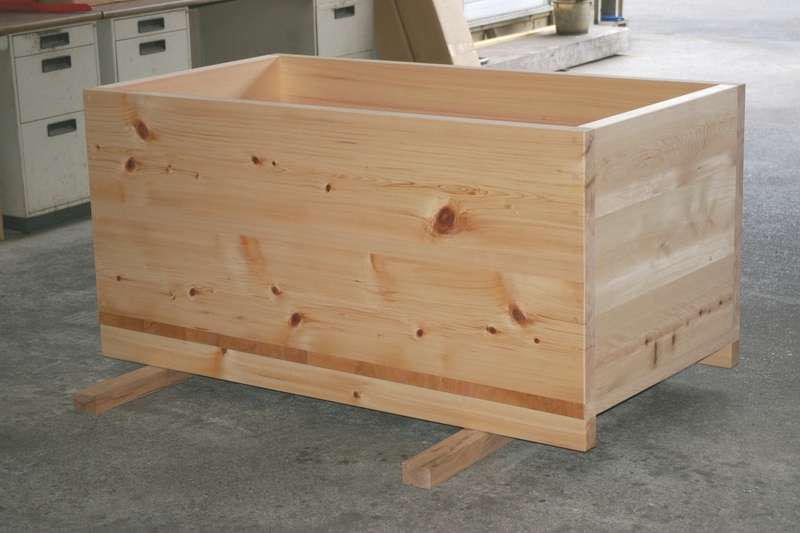 This is a more economic version of the [pocket onsen] using the normal hinoki oil. This does not mean it is inferior, aroma is really a matter of personal taste! The use is very simple! 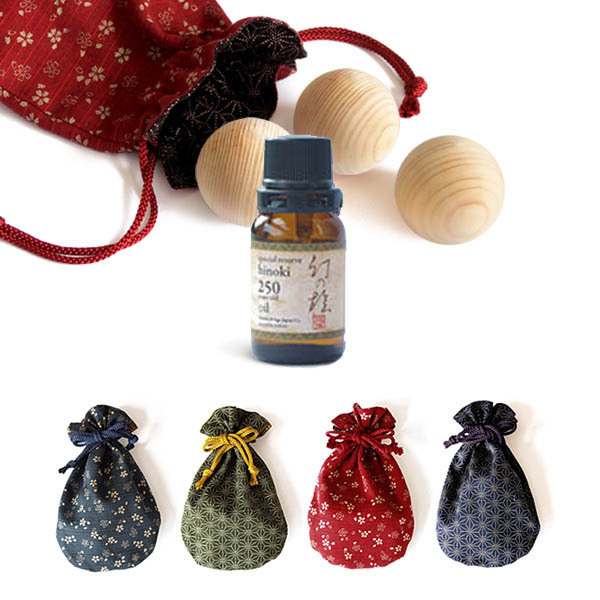 Just pour few drops of the “Japanese Cypress – hinoki aroma oil” included in the kit on the orbs and place them in the hot water. You can use the orbs over and over again. Since they are only 3, you can easily store them on a shelf in your bathoom. 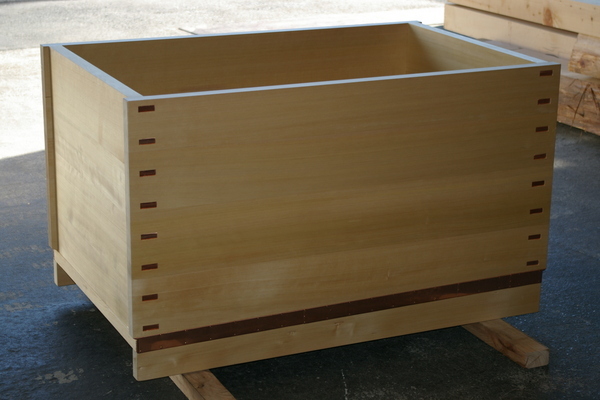 The pocket onsen comes in a high quality paulownia wooden box with the Bartok iron brand. Ideal for a gift! This idea would enable to enjoy the relaxing properties and atmosphere of a japanese bath even people who do not own a wooden bathtub. 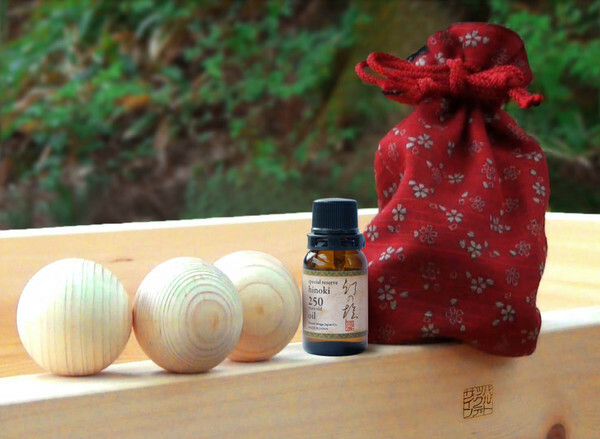 Just pour few drops of the “Special reserve hinoki aroma oil” included in the kit on the orbs and place them in the hot water. This project was developed in indiegogo, you can google for “pocket onsen” to find out about the process.